I’ve run into a number of folks these past few days who read my piece last week: The State of Digital Media: Passion, Goat Rodeos, and Unicorn Exits…. Some of you have asked me to explain a bit more on the economic issues regarding media startups. I didn’t really go too deep into them, but as I was answering one fellow in email, I realized I didn’t really explain how complicated they really are, particularly if you want to make new forms of publications. I’ll get into that in the second part of this post, but first, I wanted to address a few articles that have touched on a portion of the issue, in particular The Pretty New Web and the Future of “Native” Advertising (by Choire Sicha) and What happens to advertising in a world of streams? (by Matthew Ingram). Both these posts tackle the emerging world of “stream”-driven content, painting them as opposite to the format we’ve pretty much used for the past 20 years – “page”-based content (like this page, for example). An established, at-scale business model exists for page-driven content, and it’s called display advertising. And anyone who’s been reading this site knows that display advertising is under pressure from two sides: first, the rise of massive platforms that harvest web pages and monetize them in ways that don’t pay the creators (Facebook, Twitter, Pinterest) and secondly, the dramatic growth of programmatic buying platforms that do pay creators, but the payment amounts are too low to support great content (second generation ad networks called DSPs, backed by agencies and their marketing clients). Sicha and Ingram note that “stream”-based models – the latest to get attention is Medium, from Twitter co-founders Biz Stone and Ev Williams – eschew display advertising. Platforms like Twitter and Facebook are focused on stream-based advertising (Facebook got to its initial billions in display, but is pivoting to Sponsored Stories, Twitter has always been about its Promoted Products). Everyone expects similar in-stream products from Pinterest and Tumblr. Stream-based advertising products are “native” in nature – which is to say, advertising that acts much like the content it supports. But as I’ve advised in the past, those platforms simply don’t work as home bases for people who want to make a living from creating great publications. Nor, to my mind, are they particularly good media experiences – the way a great site or a great print publication can be. For now, the good old-fashioned page-driven web is where folks like The Awl and GigaOm execute their product and collect their money. Display is their model, and that model is under pressure. What to do? This is a question that matters, a lot, because there are literally millions of sites that currently run on the display model, like it or not. Well, I don’t think it’s as hard as it might seem. While folks are pretty freaked out about the decline of display, I’m a bit more patient. We’re in the middle of a shift, and it’s not as radical as some might think. We need “native advertising” for the independent web – and it turns out, we’ve already got it in the form of new, integrated content units that fit into the flow of the page-driven web (see image of FMP’s “native conversationalist suite,” above), and, of course, content and conversational marketing, which we’ve been doing since 2006. The issue we now have to tackle is scale (the ability to buy native ads across the web efficiently and in large numbers) and data (the ability to buy these ads with excellent targeting, performance metrics, and application of first- and third-party data). That’s going to take time, but it’s already underway. The technology and efficiencies of programmatic buying will, over time, marry with “native” ads, driving higher value for great content. (More on this in another post). And by the way, “traditional” display isn’t going to go away. It’s just going to get far more efficient and valuable as the data gets better and better, programmatic begins to climb up the value curve, and the units evolve to better complement new approaches to content presentation across all instances of the web (including apps and big platforms). So far, I’ve been talking only about publishing on the “traditional web,” for lack of a better phrase. Nearly all web publications are driven by the display model, which is in turn driven by page views. But we all know the web is shifting, thanks to mobile devices and the walled gardens they erect. The new landscape of the web is far more complicated, and new products must emerge. To wit…. I think there’s a reason there’s a paucity of digital magazines, and it has a lot to do with the current, fractured state of digital publishing. In short, if you want to create such a product, the curent ecosystem makes it nearly impossible to do so. I think this is changing, but so far, not fast enough. Just for kicks, let’s say you want to start the equivalent of a “new publication” in the Internet space. Let’s further state that you want it to be relatively cutting edge, IE, you want it to be available everywhere your customer might be, and take advantage of the digital environment where it lives. That means editions in the Apple iTunes store, Amazon’s Kindle/Android newsstand, and Google’s Play (Android) store, for all those Android smartphones and tablets storming the market. And of course, you want to exist on the web (with spiffy HTML5, natch). Oh, and it’d be nice if you could also have a great version of it exist on Facebook, no? Ready to get to work making this happen?! OK. Well, let’s use the “old” model of magazine publishing as a starting point to model your costs. In that model, you spent about 35% of your operating costs in “audience development” – paying for circulation and newsstand costs, as well as the costs of selling your product to advertisers (assuming you are going to both charge a sub fee, and include ads, which most “traditional” publications do). Another 20-40% (depending on how much you care about your product) are spent on actually creating your content. You know, paying editors, designers, writers, videographers, etc. Add in 25% of your cost to make and ship the physical product, and the remainder is “G&A” – paying for management staff. As you can see, the variable cost here is in “creating your content,” and if you’re a passionate creator of media, you want to spend every dollar you can creating a great product, naturally. The problem is, if you’re making digital media these days, the costs of packaging that content have skyrocketed. Imagine making a magazine that has to be natively integrated into half a dozen or more different newsstand formats. Instead of one consistent, beautiful page layout, you have to make six of them – one for each device and distributor, each native to the environment. You don’t have to pay six times over for the content, but you do have to pay a lot more for your design, production, tech, and distribution resources. You want your content to shine everywhere it might be consumed, right?! Blam, your fixed costs of making the product just went uneconomic! Which begs the other side of the ledger: Revenues. As I said before, traditional publications have two sources of revenues, in the main: subscriptions (paid circulation) and advertising. As we all know, the industry has historically punted on getting anyone to pay for content on the Internet, but that’s changing – people pay for Netflix, the Wall St. Journal, Spotify, various apps, etc. I think folks will pay for quality content if it’s truly valuable, so let’s pretend for the purposes of this example that your new publication plans to be in the “valuable” category. If you want to sell your publication on the Big Guys’ platforms, you have to play by their rules, which means you turn over 30% of your circulation revenues. That’s a hefty chunk of revenue to lose before you even begin to pay for other costs! You can keep all the revenues from folks who buy your publication on the web, but if they want to enjoy it on their iPad or Kindle via a native application, well, you have to deal with Apple and Amazon. Google’s Play store takes a smaller cut, but it takes a cut nonetheless. Just for arguments’ sake, let’s say that you cancel out that 30% tax with what you used to call “audience development costs” for traditional publications. You’re pretty much even, right? Nope. You now have cross-platform inconsistencies to work out, and those are going to cost you money to manage. What if your customer has more than one device, or wants to engage with your app on Facebook? Sorry, you’re kind of screwed. There’s no easy way to rationalize your customer experience across all those platforms and devices in a way that makes business sense. So many gatekeepers, so many business rules, so many tech platforms…. You’ll have to account for the costs of managing a data platform that keeps track of all your customers (including your advertisers) and insures they have a consistent experience across platforms. And you’ll have to build that yourself, sorry. The only folks who’ve figured that out are Very Big (Amazon, NetFlix etc), and they’re not sharing how they do it. It’s doable, but it’s gonna be expensive if you want to roll it yourself. I’ve heard that some new publishing startups are trying to do just that, and I wish them godspeed. To cope with this particular mess, some publishers, like The Daily, have decided to go with just one platform (Apple), and cross their fingers and hope it works out. Others, like the Times, have pushed themselves across several, and expended heroic resources trying to tie it all together (without totally succeeding, in the main). But remember, we’re talking about a new publishing startup here, not the New York Times or Newscorp. If those guys are struggling to make it work, well, what’s the chances a startup media company is going to succeed? Then there’s the revenues associated with selling advertising. As I pointed out earlier, the traditional web display model is under transitionary pressure, and anyway, you want your content to work everywhere, not just the web. If you want your advertisers to be everywhere your content is, you’ll have to figure out a way to get their ads natively into all those half dozen or so platforms (oh, and you’ll need to report performance metrics too, sorry). So far, that’s also an unsolved problem (and one your advertisers won’t pay you to solve). That’s going to limit your ability to sell ads, and increase your costs of serving them. OK, I’m going to stop, because if you’re an aspiring publisher, I may have given you a fit of the blues. But cheer up. Because I really do believe these issues will be solved. So far, we’ve written off magazines as dying, because we can’t figure out how to replicate their core value proposition in the digital world. But I’ve got a strong sense this is changing. Crazy publishing entrepreneurs, and even the big players in media, will sooner rather than later drive solutions that resolve our current dilemma. We’ll develop ads that travel with content, content management systems that allow us to automatically and natively drive our creations into the big platforms, and sensible business rules with the Big Guys that allow independent, groundbreaking publications to flourish again. It’s going to take time, patience, innovation, and pressure, but we’ll get there. In fact, getting there is going to be a great journey, one we’re already well into. So tell me – what’s your favorite digital “publication” and why? 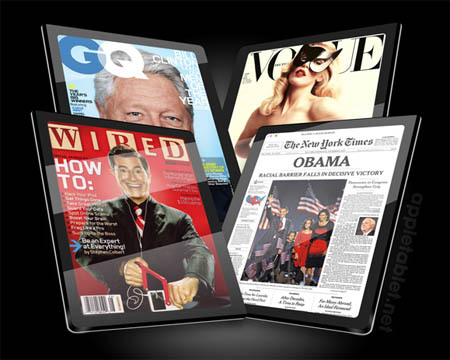 Do you read “traditional magazines” on your tablet or online? And what companies do you think are innovating in this area? *Some have argued that the era of a branded publication created by a dedicated team of content creators is over. I utterly disagree, but that’s another post. **The fact that these two “old media” formats have mostly solved their digital distribution issues, whilst magazines have not, is vexing. A movie is a movie, a book is a book – you can read it or watch it online in nearly the same way that you can offline. Movies, TV shows, and books can easily flow, with very little new formatting, into any digital space. But a magazine clearly is a different beast. We don’t want to just flip through a PDF of our favorite magazine (or do we? Do you?). Something seems off, doesn’t it? We want more…clearly, the magazine holds some magic that so far, we’ve not unlocked. What a wonderful problem to think about…. The Economist does a fabulous job on the iPad! I’ll have to read it there. So why do u think The Daily is not succeed? I am not a reader, so I can’t say subjectively. The press reports around it are not positive, and it recently laid off a third of its workers. Fast Company has a pretty interesting digital presentation. I enjoy the enhanced features which create a better user experience but dislike their slow download process. Overall, they have a vivid and rich feel – pretty amazing view on the new iPad. Wired from Jan 1993 till Dec 1998, Mondo circa 1990s and earlier Whole Earth Catalog… There are no matches for these… You are very right. But what is the actual reason behind this? The difficulty of distributing content on many different form factors? This is not a hindrance for an entrepreneur who wants to say something using the digital magazine format. Tell me, what is the business model she is going to use? Wired used to sell on the stands and I subscribed with the first issue until it was sold to Conde nast. What would the business model for this new magazine be? Ads? I don’t think so. There will have to be a new paradigm for a new Wired. Check out what the guys at http://seshn.com are doing! I’ve been writing a daily blog on motoring for the last three years, google psychoontyres, I’m in no way a techy I have just about got to grips with WordPress and it has puzzled me how the big players cope. I am glad to hear only the really big shots cope and the rest of us are struggling to keep up. Thanks to your article I am happy for now to stick with desktop/laptop users and will make enquiries with my tech man about going mobile friendly. After that I’ll let customer demand determine any further divergence. Thanks for clearing a few issues up. There are many choices to mobilize your site, and not a lot of options for sorting through them. We hope to address that in future releases of the FM platform. Previous Previous post: The State of Digital Media: Passion, Goat Rodeos, and Unicorn Exits….